I was going through some old Halloween costume posts and realized I never wrote a costume tutorial for Adeline’s felt candy corn costume that she wore at 16 months. I went back to our 2012 photos and found a few in case anyone is looking to make a simple little girl costume this Halloween. Felt is one of my favorite materials to use when making costumes because it doesn’t fray and you don’t have to finish the edges. Since a costume is worn for such a short period I like to keep it simple. 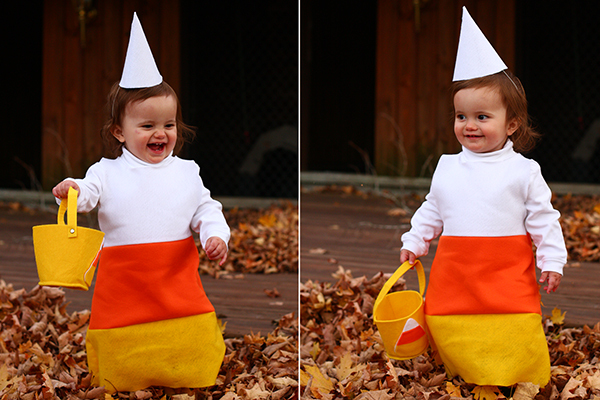 This candy corn costume involves just a tiny bit of sewing, but nothing difficult. 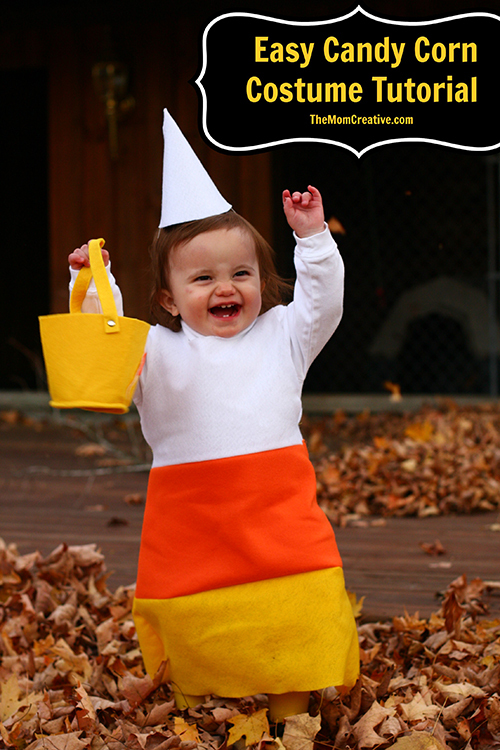 For this adorable Halloween candy corn costume, you need felt in three colors – white, orange and yellow. Use a child’s dress to measure how much felt you’ll need. You want to shape it like a candy corn, getting wider with each part. Use white on the top. Cut a hole for the head. At the end, you will simply sew the sides below the holes needed for the arms. Sew the pieces together into a big sheet, being sure to measure so that the front will match up to the back. For the candy corn costume hat, cover a party hat in white felt. Hot glue the felt to the back of the hat, then wrap it tightly around the hat and hot glue the end. Trim extra felt. Add a white long-sleeve shirt or onesie and yellow tights to complete the candy corn costume. 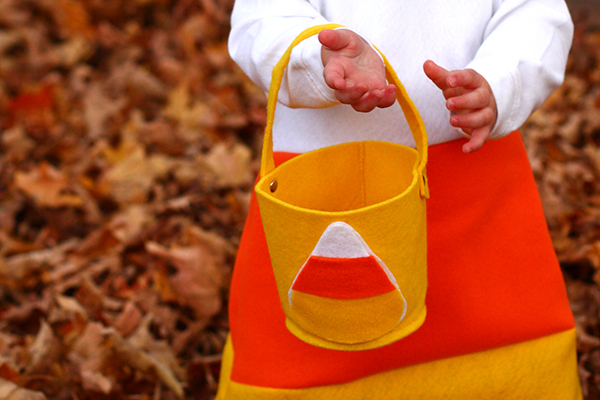 For some added cuteness to this candy corn costume, make a candy corn treat basket. Use a felt bag from Target’s dollar section and gently peel off whatever felt design comes on the bag. Then cut out a small candy corn and glue it on the bag. Easy and adorable! This costume was a huge hit! I hope this tutorial helps you this Halloween. I love this! It would be perfect for my 21 month old. Pinned and stumbled. Stopping by from Link Party Palooza. LOVE it! She looks super cute in this costume. too cute, love it we need to get to finding some cute outfits for Halloween here as well. This is adorable! She looks so cute and it seems so easy to make. Thanks for sharing! This has to be the cutest thing I have ever seen!!! If I had a little girl, I would definitely dress her up in this!